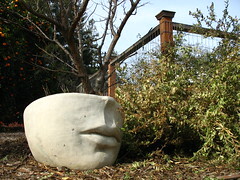 Early morning, mid-summer at May Dreams Gardens. It's been an unusually wet summer, with abundant rain just when we needed it, and no really hot days so far. 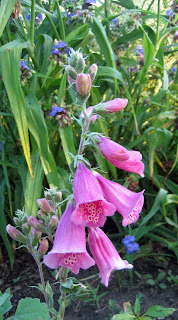 The foxglove are starting to bloom on new plants purchased this spring. The little spots on the inside of the flowers are fairy foot prints, indicating a lot of fairy activity in the garden this year. 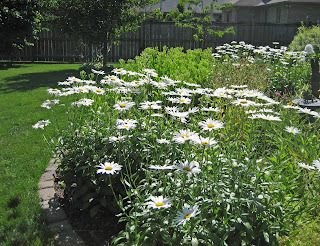 The shasta daisies dominate wherever they are. I took this picture in the early morning, just as the sun was coming up on a beautiful day. There are also nice clumps of coneflowers here and there. I'm showing these with the shrub clematis, which has been blooming non-stop for quite awhile. Those bell shaped flowers are attracting bees and garden fairies galore. 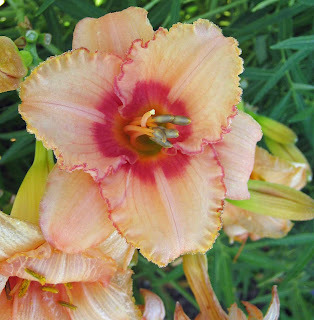 Out in front, these 'Eenie Meenie' daylilies are just starting to bloom. They are supposed to be rebloomers, but didn't do much reblooming last year, perhaps because it was so dry? We'll see what happens this year. 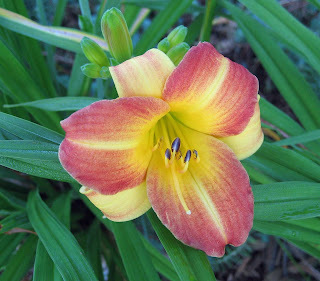 Another daylily blooming now is 'Strawberry Candy'. I found the tag earlier when I started my project to catalog all the plants in my garden, and thought I no longer had this one. But it has been blooming quite a bit to show me it's still here in the garden. These 'Endless Summer' hydrangeas love all this rain! Now, that's pink! I'm also seeing pink in the Zinnias, started from seed in late May. 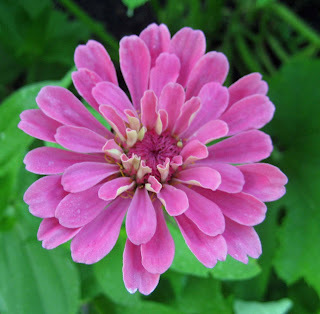 I should also see several shades of purple, white and my favorite, green, zinnia flowers. Did I mention the garden fairy activity in the garden? I wonder if they are responsible for these double-white columbine? These should not be blooming now, but they are. They are like ghost flowers, reminding me of spring time in the garden. Finally for those of you who looked at that picture of Shasta Daisies and immediately thought, "she needs to deadhead those spent blooms", I did just that. I like how my garden is right now. I can tell you it is better to have a lot of rain than to have too little rain. Comparing notes with last year, I don't have too many new flowers, at least that are blooming this time of year, but I'm happy with what I have, because there are more of them. But there are a few flowers that were blooming last year, like False Sunflower and Four O'Clocks, that aren't blooming this year because I pulled them out for "conduct unbecoming a well-kept garden". 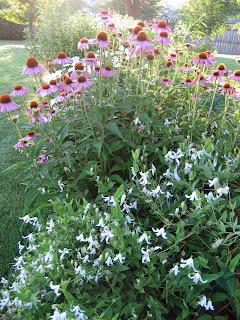 There are also many blooms in container plantings which I'm too lazy to list, as it would be the same list all summer. Do you have a garden full of blooms? Join us for Garden Bloggers’ Bloom Day on the 15th of each month by posting on your blog what’s blooming in your garden, and then leave a comment here so we can find you and visit to see all your pretty flowers. I am pretty sure we have your red daylily that I have been reading about. Very nice--I have a blue clematis integrifolia that I posted about, but I really like your white one, too! My July Garden Bloggers Bloom Day Post is here. Throwing out the Stella d'Oro? Throw it my way please. I love my tiny clump of it and wonder if we are talking about the same dainty little Daylilly. My Bloom Day post for July is HERE showing some highlights in an otherwise rather bedraggled garden. Zinnias seem so exotic to me and I have not managed to grow a single one here in the UK. do you have them in many colours? Forgot to say that those early morning shots are absolutely lovely. That one of the coneflowers and herbaceous clematis, taken against the light, is really beautiful. It must have been so fresh to be out there at that time of day. 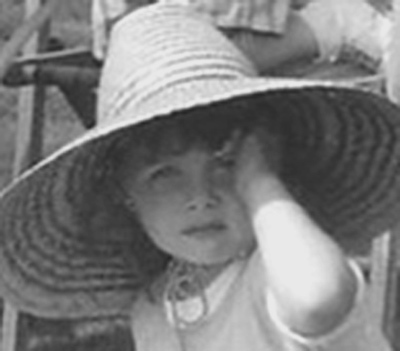 I've just merged my two gardening blogs together, so as from now on, my blog is bilingual. I hope you don't mind. I hope that the rain has finally stopped to give us a long overdue taste of summer. Please come and visit me at my bloomday pages for a quick look at what is cheering me up at the moment. Thank you for giving us the chance to find other festive pages today. I couldn't find mention of the name of the clematis in front of your echineas. I will have a go at letting a clematis wander through a border. Does it root by layering when you do that? I am glad you are getting plenty of rain, but hope you have been spared any flooding that other areas have suffered from. Your garden seems to be enjoying it, the shots are lovely. We were in a bad way in June rain wise, but July is turning into a wet month and with the heat we are getting rampant growth. My post is up. Raining now, although the sun did peek through long enough for me to rush around and take a few photos. I love zinnias, so cheerful. I can't grow them, they seem to like very warm weather, not chilly Irish summers. The white columbines are beautiful. Yes, things are blooming now that should have finished earlier in the season. Hi Carol, your garden is lush and wonderful, rain certainly will help those daylilies rebloom too. Strawberry Candy is a fave, I have Elegant Candy, daughter Semi has Strawberry and Wineberry. My post is up also. Love your Daisy/sun picture. The other day we were driving through a commercial area and stopped counting at 50 patches of Stella. It is way overused in this area. I have a Bloom Day Post this month. Oh my golly, I lost track of the date and just did a blog post about everything BUT flowers, lol! I took pics of what's blooming in the neighborhood, but aside from my one lil pepper bloom, nothing has opened yet in my mini-garden. Guess I have some flower photos to crop and post later on today! But in the meantime, y'all can click on my name if you'd like to go to my blog. Thank you, Carol, for hosting GBBD! Oh, I miss daylilies! I'm just going to have to find some here in Honduras. Here's my entry - not nearly as comprehensive as some, but time is getting away from me! Hi Carol - it's interesting to see how your garden has some flowers that are now over in mine, some that are also there and others that are still to come. My offering for GBBD July is up. Your strawberry candy daylily is a stunner. We sowed some wild seeds and many zinnias came up. I disliked zinnias at first because the pompom ones which seemed to be very popular and ubiquitous when I first saw zinnias were not to my taste. I have a new appreciation for the plain ones like the one you photographed beautifully. When I looked more closely at the flowers the inner small petals were different than the outer ones giving the flower a more complex look as well. Thanks for hosting GBBD! It seems like more is blooming this year, but perhaps I just wasn't as thorough listing last year. Fabulous blooms...I love the shrub clematis and the double white columbine. Great post for GBBD, Carol. Your July blooms are very abundant. Get ready for some real July weather this week. My GBBD post is up; thanks for hosting--I look forward to this each month! We've had plenty of rain this summer too which has helped to keep the garden in top shape. Love your Foxglove and Columbine - gives me ideas for next year! I love Garden Bloggers' Bloom Day! Good Morning Carol. Your garden is lovely as ever. I always see your pictures and think, oh I need that, I need that. I love your description of Foxglove with Fairy footprints. And I love the shrub clematis too - I need that. Thanks and Happy Day to All! This is my first time participating. You have such a lovely garden! Mine is very small, but I love it. I posted my GBBD on my blog. I MUST have some of that bush clematis. I have been resisting buying it because I wasn't sure it would perform well here. Judging by your picture, it likes the Midwest just fine! Oh, my post is up now! Thank heavens you don't require botanical names!! I would never get to post. Half the time I don't even remember what the variety names are of things I plant. Long ago, when I bought huge naturalizing collections of things, which never give you names, I gave up even trying to know everybody's name. I suppose I could make some up! You made me jealous with your shasta daisies. They don't seem to work for me down here. And rain...what's that? Kiss of Sun bloom day post is up! Thanks. 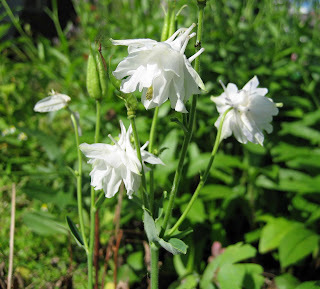 I love the white columbine. So pretty. My post is up. http://auntdebbisgarden.blogspot.com. Thanks again. This is so much fun. Beautiful blooms Carol! Your photos are great. I especially like the dasies in the early-morning sun, deadheaded or not. The foxgloves are beautiful, and I'm lusting after your very pink hydrangea! Everything looks wonderful. What a great summer so far. My post is up this morning. Thank you for hosting GBBD! Wonderful as usual Carol. I'm just loving those daylilies! I have a pletora of plants blooming in my yard. My post is up too. Thanks for being such a wonderful hostess. Very intense colors this time. The Strawberry Candy daylily is one of my favorites! Thank you for GBBD! Now that there isn't much happening at Zanthan Gardens, I'm going to spend the day enjoying real summer in all these northern gardens. Iced tea? Lemonade? I LOVE the daisies. This is my first year having them. I don't know why I've deprived myself so long. 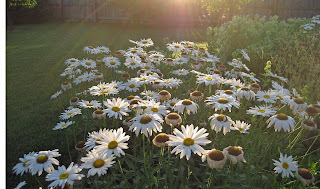 I love that photo of the shasta daisies with the first sunlight of a summer day illuminating the blossoms. Your daylilies are lovely and I'm envious of your hydrangeas. Carol, What beautiful photos, and gardens are so lovely and fresh in the very early morning. My posting is up at www.commonweeder.blogspot.com but my best season is in June when my hardy rose collection is blooming. Still a few things are coming along, and I'm not ashamed to claim the Queen Anne's Lace and yarrow that grow by my roadside. I look forward to this! thanks for being the hostess w/ the mostest! My blooms are up, too! Hi Carol-I love the beauty in your garden. The photo of the daises is especially breathtaking. My july post is up! Carol, those foxgloves are lovely! My hydrangea-filled hasty Bloom Day post can be found at http://lakechicagoshores.wordpress.com/2008/07/15/bloom-day-july-2008/. Arrgh - my comment didn't get posted. Yes, mine's up, http://mcgregorsdaughter.blogspot.com/2008/07/july-bloom-day.html, but I have to recreate what I wrote about your garden. It was something about the Columbines, how the cooler temperatures & rain have prolonged their bloom. Many of mine are still blooming & have buds. I remember, I also wanted to say that I'm glad you've ID your Clematis as the Comtesse, which is what I had thought it was. What a great Clematis. Boy, do I wish I had an "unusualy wet summer"! Instead I have a summer dry as usual... Withe the drought my garden is not looking all that good Carol, nevertheless I managed to find a few blooms. Your garden is looking lovely, I specially like those daisies in the morning light. The 15 of each month gets my mind flowing with ideas! We must get out of this drought down here in Georgia so I can put those ideas in the ground! I'm in northeast Ohio, USA. 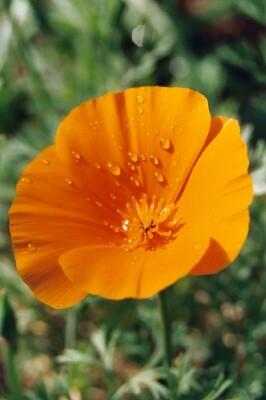 And your pictures are wonderful, happy bloom day! Carol, I sure wish I could come visit your garden. Sigh. Hi Carol. I just discovered Garden Bloggers Bloom Day and immediately went out and took some photos. Thanks for the inspiration, motivation, and/excuse :) to do so! Carol, I love your morning shot of the daisies - I'm a bigger fan of those this year than ever before (maybe because they're almost the only thing blooming in my own garden...) and green zinnias are my fave too. Happy Bloom Day from all of us birthday girls at Blithewold! All your hard work is definitely paying off, Carol. I love those double white columbines! It's a good thing you're on staycation because it would appear you have some late nights ahead of you reading all our Bloom Day posts. 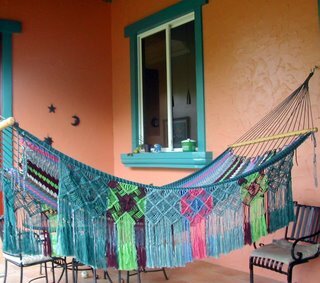 Mine's up at http://texascottagegarden.blogspot.com. Each day has a new surprise in the weeds at the new house! I'm finding more and more beatiful flowers that the previous owners left behind. We Indiana gardeners tend to have some of the same--cone flowers and daisies! have really enjoyed looking at everyone else's loveliness. Thanks for giving me a kick to get out there and realise how many flowers I had! rats... couldn't make it work. Wow 61 comments already. I envy your foxgloves. They are one of my favorite flowers. I planted some this year, but they won't bloom until next year I think. They are sad little rosettes right now. But they will be worth it. I know you've visited already but I thought I'd comment to make for easier counting for you! I always pull lots of my 4 o'clocks too...but I just can't do without a few...reminds me of my childhood! I love that Strawberry Candy daylily...sigh..so many plants, so little room. And don't worry about the shastas...they need deadheading too often to keep up! 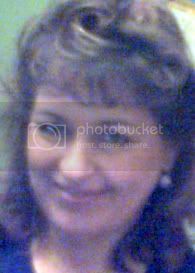 Hi, Carol, I've joined in your Bloom Day celebration this month. Your pictures are really gorgeous. ...plus a few others... really an amazing amount going on in the garden right now, isn't there? Here is my GBBD post. Not much is blooming. Too hot! I love your shasta daisies. I am planting some next spring! wow, you have a busy blog! I just found out about this bloom day from another blog so I joined in. Beautiful pictures! Thanks for bringing gardeners together from all over the world. Here are my pictures from Austin, TX. Thanks for starting this idea. I love seeing what is blooming in gardens around the country. Just posted my list of blooming flowers, but I have had trouble uploading photos. Carol, thanks for giving us this opportunity to have a record of what is blooming each month. Iloved the daisies in the sun photo Carol. Seeing that 'ghost flower' made me realize I would like to have more white in the garden. It looks so good in the shady part of my garden. Hasn't this been the best summer so far?? The cooler temps and all that rain has done wonders for my flowers too. I have some posted now. Hi Carol, I've just added a bloom day post from Nova Scotia. Our columbines just finished blooming several weeks ago. What a special gift your double white was. Cheers! Some great blooms this month...where did the time go? I like your coneflowers...well I've always liked them in bloom. Quite a few things have bloomed here over the last month...but not the coneflowers yet. Just made it! My post is up. I like the double white columbine. I hope the plant I got this spring will bloom next spring. You still have a columbine! Lovely gardens! I love the first photo of the daisies. My lilies are in full bloom too. I'm late getting it up, but here's my blooms. 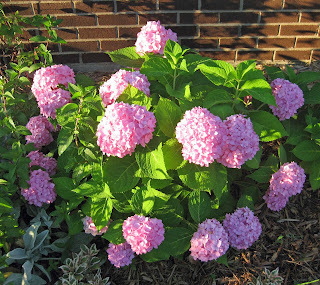 Great blooms, I especially love what the rain's been doing for your hydrangeas. Your garden is lovely, Carol - the daisies in the shaft of morning sun look like a painting and the coneflower clematis combination is really pretty. 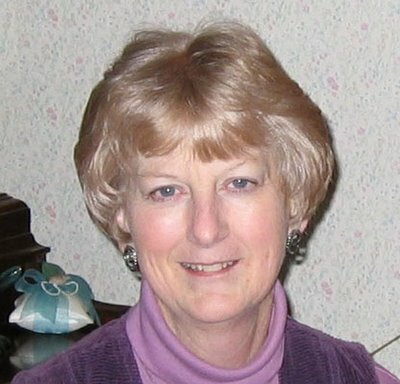 LOVE your blog Carol - I look forward to it every single day. As always, your garden looks lovely. I love that pink zinnia! oh, what you do for us insomniacs! I left a comment earlier, but don't see it here...who knows? You make me want to get to bed so I can see that early morning scene. I love that shot of your daisies at sunrise. It is such a serene image. Thanks again for doing this. I love Bloom Day. Thanks again, Carol! I'm swooning over your lush blooms, especially my favorite hydrangeas. I'm a day late, but I've posted my GBBD pics now, too. Wow, Bloom Day is quite the event these days! :) Got mine in, late but here. LOVE that daisy picture, and the white clematis looks like "something I need" :) Happy Bloom Day! You have a beautiful garden! I popped over from your Wordless Wednesday page. You have an eye for gardening and photography! Well, last month I was the 100th commenter, I was almost late enough this month to be number 100 again. I agree with you the garden is so much nicer this year with regular rainfall. My GBBD post is up now! Hi Carol = My "better late than never" GBBD post is here http://cultivatingparadise.blogspot.com/2008/07/gbbd-july-edition.html When I grow up I'm gonna be organized . . . . Your garden's looking lovely and my balcony certainly can't compete. By this time of the year the pests have kicked in and everything's fighting for its life. One of the few exceptions are the Four o'clocks - so that's what I've chosen to focus on for my GBD post this month. A bit late, sorry. Thank you to everyone who joined in for Bloom Day. I think I visited everyone's blog who commented and left a comment. If I didn't leave a comment on anyone's bloom day post, it was an oversight on my part and not an intentional slight. I'm looking forward now to August Bloom Day! I'm late adding my garden to the list, but maybe better late than never. Here's what was blooming in my garden last week. Thanks so much, Carol. This is such a wonderful idea! I am frightfully late, I apologise. I hope there is some cake left. Sorry Im so late. I have been so unmotivated to post on my blog lately. I made it though. Here is my GBBD post.